This is nearly an hour of priceless color film from the 1950s featuring steam in regular service! 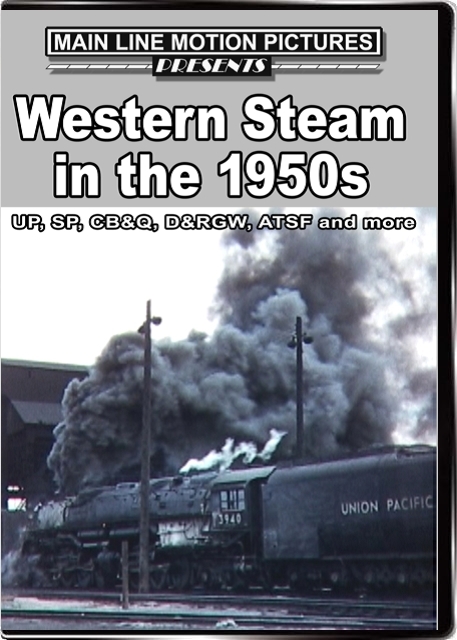 Featured railroads include the Union Pacific, Southern Pacific, D&RGW, CB&Q and the Great Western. You'll see SP commuter trains, UP 844 in regular service plus Big Boys and Challengers. On the main line and in the yard.Scenes include Denver Union Station and San Francisco. This is mostly 16mm unedited, silent, film, transferred to digital so that these long-gone scenes can be shared and included in your collection.